We all know the Espresso, now meet its new replacement, the People One 125i. 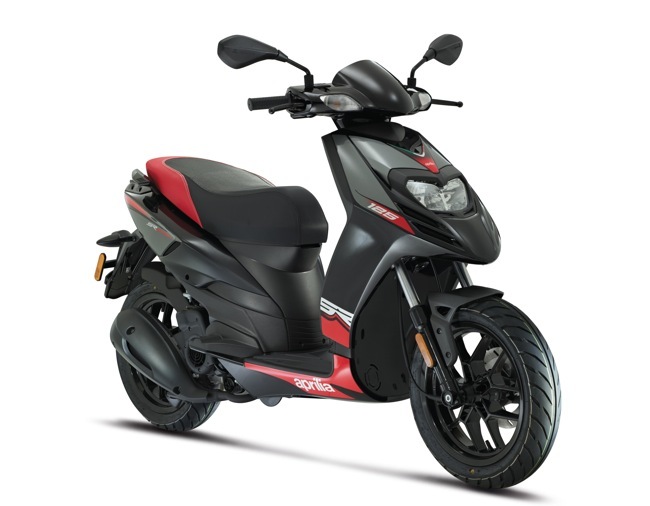 Kymco have recently released the all-new People One 125i in Europe. 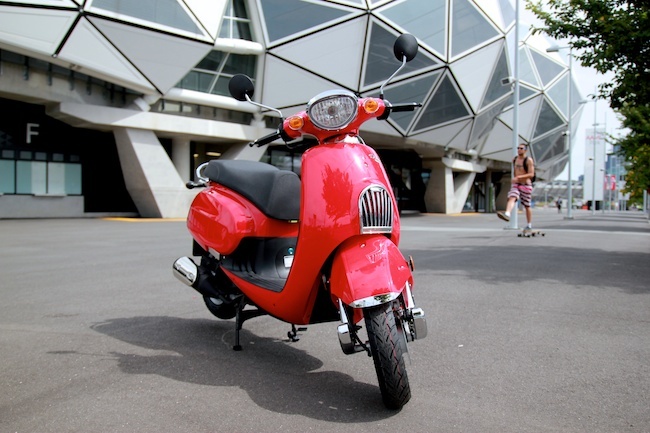 The new People is the replacement for a scooter that we already affectionately know in Australia as the Espresso. 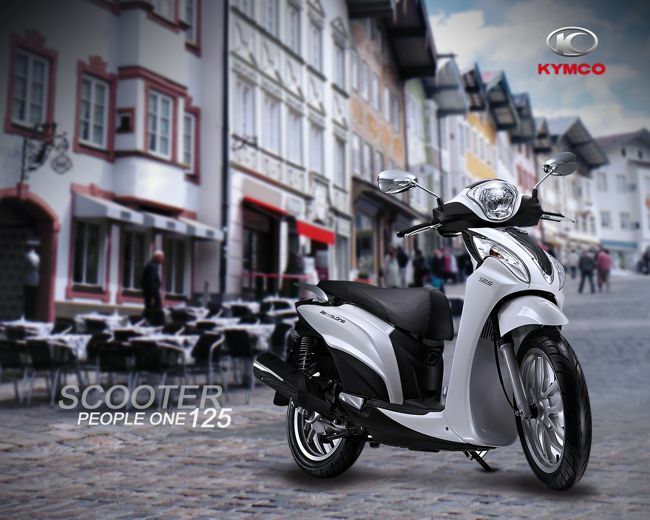 The People One 125i is a model that competes directly in Europe with scooters like Piaggio's big selling Liberty. 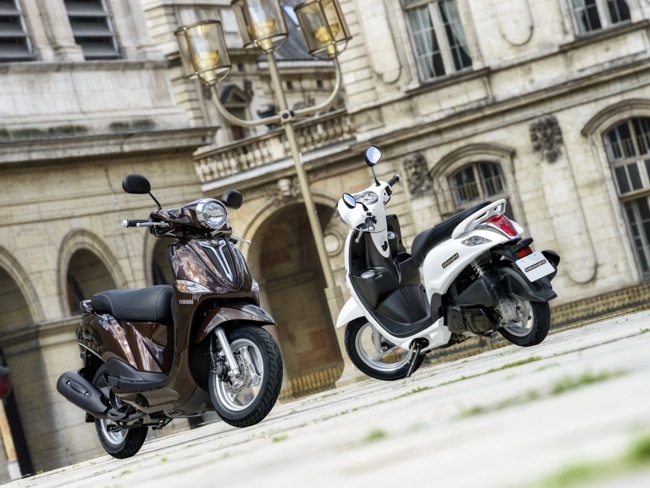 Italy is a key market for Kymco and the new People One is a crucial model. The People One 125i comes with a host of changes over its long-term predecessor. Firstly, it is now fuel injected and 125 cc, the People One prides itself on low fuel consumption. The rear wheel has been changed to 14 inch (was 16 inch), now smaller to create more room under the seat. 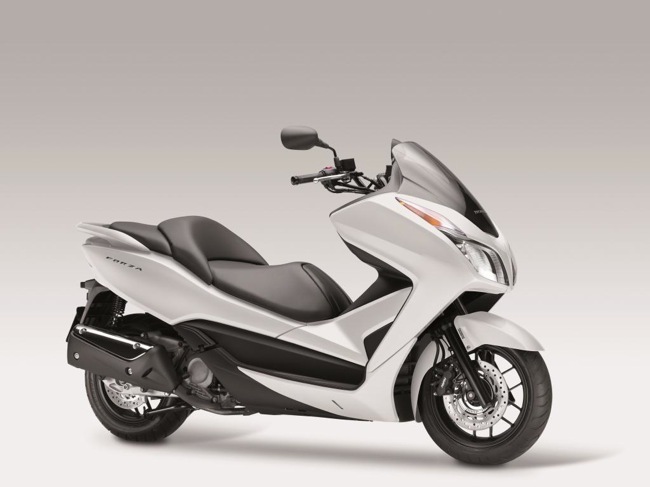 Styling is all new and in a way, very comparable to Honda's new SH 150. The People One also features a box ready rear rack. Dual rear shocks do remain a positive feature for the class. The ignition key even features a light, handy for those night time starts. The fuel tank has been relocated to the front, and the wheels are an all-new design. It's not clear if we will see the People One 125i here in Australia. In Italy the new Kymco sells for just under $2500 Euro. The People One here would need to sell for under $3000 to remain competitive. Given Kymco no longer make the Espresso, the People One 125i would be a welcome big wheel replacement. Honda introduces a new colour for the dual clutch Integra. Now available in a very smart looking black colour scheme. When Honda released the Integra early last year it was just the one colour choice - Blue or Ion Blue Metallic to be precise. Now Honda backs this up with an all new colour - Black. Honda's NC700 maxi is a unique one. It shares its chassis, running gear and dual clutch transmission with other motorcycles in the mid concept range. The Integra though is different, it's a maxi scooter that comes with all the conveniences of a scooter, yet integrates all the handling benefits of a motorcycle. "Take it for a ride, not just around the block and you'll find yourself falling for this one. The transmission alone is enough to sign on the dotted line. For those looking for that next step after a scooter, the Integra could very well be the answer. Price is right, convenience and comfort are not lost in the transition. The ability to ride anywhere in Australia on one machine is an added bonus. This is an intelligent two-wheeler." The Honda Integra 700. Now available in a smart looking black colour scheme. Still priced at $10,990 plus on roads. Yamaha has released a new retro big wheeled scooter. The D'elight looks like it might just be that, a real light weight delight. In response to scooters like Honda's Dio(Vision), Yamaha has now responded with a competitor of its own. The new D'elight is Yamaha's answer, a scooter with a weight of many 50 cc scooters with the performance of a 125. The D'elight weighs in at just 98 Kg's with a power output of 5.3 Kw's. The D'elight is Yamaha's lightest 125 cc scooter it builds. The emphasis is around "easy" commuting at an affordable price. In Europe the D'elight will sell for under $2000 Euro. Other key features include fuel injection, low seat height and a large 180 mm front disc brake. Sounds to me like a good all-round low priced, city commuter. I'm also expecting we might see this one in Australia at some point. Being built locally in Asia is a bonus. See the official Yamaha presser below. .
One of the most important and significant aspects of the new D’elight is the fact that it is one of the lightest and most compact scooters in the class, making it ideally suited to urban commuting where agility and ease of use are important attributes. 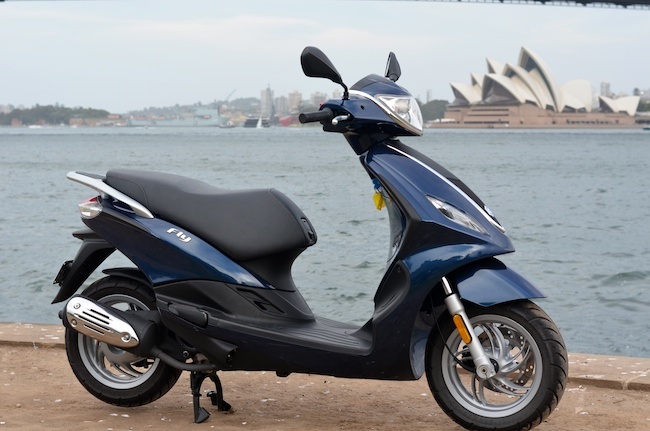 In fact, the D'elight is so light and compact that its overall weight and dimensions have more in common with many current 50cc scooters. 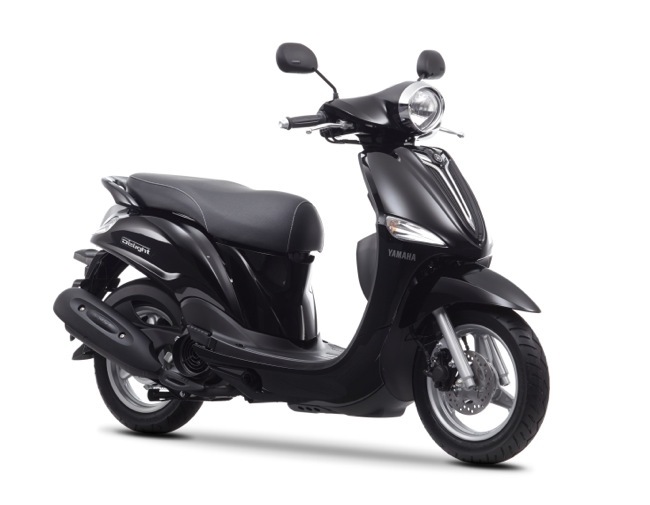 Yamaha's designers were able to build this new scooter to 50cc-class dimensions by using a specially designed tubular chassis, into which they have installed a compact 114cc air-cooled single-cylinder 4-stroke engine. The technical data may not mean a great deal when written down on a specification sheet, but for the typical rider these dimensions mean that the D’elight is one of the most compact, agile and easy-to-ride scooters in the any category. 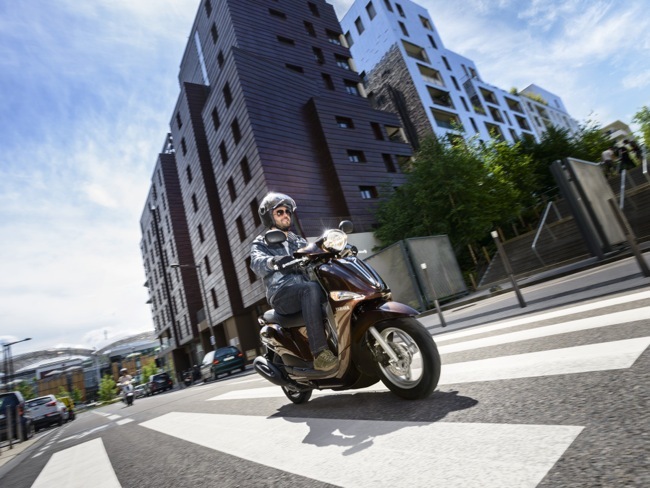 In everyday use around town, the D’elight's low weight of 98 kg, together with its 50cc-class dimensions make riding, turning and parking so much easier. To illustrate the point, it is worth noting that the turning radius of the new D’elight is just 1.8 metres, which is actually 200mm less than the 50cc Neo's. And for even easier low-speed riding and enhanced manoeuvrability, the D’elight is also equipped with a remarkably low seat height of just 755mm, which is one of the lowest in the category. Not only is the new D’elight one of the most economical forms of two-wheeled transport, it is also positioned in the marketplace at an affordable price. This extremely competitive purchase cost has been achieved by the use of relatively straightforward but effective technology, such as the air-cooled 2-valve 4-stroke engine. This combination of an affordable purchase price and outstanding economy - together with the ultra-compact and agile chassis - make the D’elight a very attractive proposition for new and existing scooter riders. D’elight is the clear choice for commuters and city dwellers who are looking for a simple, reliable, easy-to-use and cost-effective solution to their urban transportation problems. The new Yamaha D’elight represents a new direction for Yamaha because its elegant lines give it a classic look that is not commonly seen on a Yamaha scooter. The gracefully curving bodywork offers the rider excellent wind protection as well as a roomy riding position, while the well padded stitched dual seat and colour co-ordinated grab rail accentuate the classic style and allow the rider to carry a passenger in comfort. The elegant bodywork succeeds in seamlessly blending the old with the new to give the D’elight a fresh and distinctive image. The eye-shaped handlebar-mounted headlight, as well as the high front fender and white-faced retro-style analogue instrumentation have a thoroughly ‘60s feel. Other attractive features include the integrated taillight and rear indicators, as well as the flush-fitting streamlined front turn signals. For added convenience the D'elight comes equipped with a small open glove box in the knee panel area, as well as a helmet hook and flip-out passenger footrests. Featuring lightweight 3-spoke cast alloy wheels and a high quality of finish, the D'elight blends classic style with contemporary 21st century design to give it a distinctive and fashionable image. 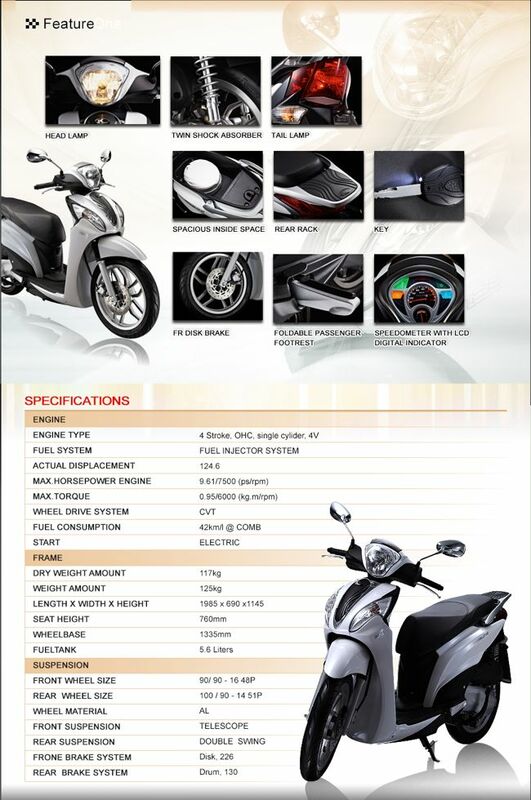 Although the new D’elight's purchase price will be set at a highly competitive level which will mirror that of some of the newer Asian brands in the marketplace, this stylish and appealing scooter is nevertheless able to offer its customers an attractive overall specification. The classic styling gives the D’elight an undeniably chic and fashionable image, which is complemented by a black footboard and front panel. Together with the black stitched seat, this practical and refreshing design matches exceptionally well with the body colour options of Milky White, Midnight Black and Magnetic Bronze. Other attractive touches include a fuel filler cap and storage pocket located in front of the rider's knees and the underseat storage is designed to accommodate a demi-jet type helmet. 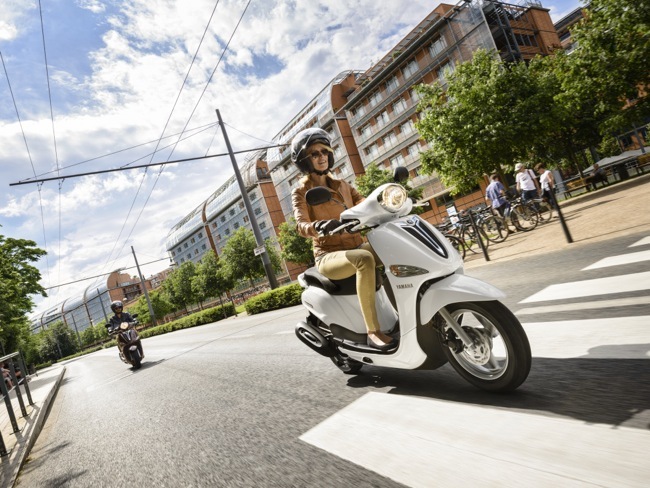 At the heart of this attractive new lightweight scooter is a quiet and economical 114cc air-cooled single-cylinder engine which benefits from YMJET-FI (Yamaha Mixture Jet-Fuel Injection) technology. Technically speaking, this system uses an auxiliary air intake passage beside the main air intake passage to provide an 'air assist' which gives improved mixing of the fuel and air for enhanced combustion efficiency. The real-world advantage of this straightforward but effective system is that it improves fuel economy and reduces emissions. Featuring a bore and stroke of 50.0mm x 57.9mm, the 114cc engine is 'over square', which, together with its proven 2-valve layout, tends to give a relatively strong torque output at low to mid engine speeds. Indeed, the maximum torque of 7.7Nm is produced at 5,500rpm, which gives the D’elight plenty of strong pulling power for lively acceleration. 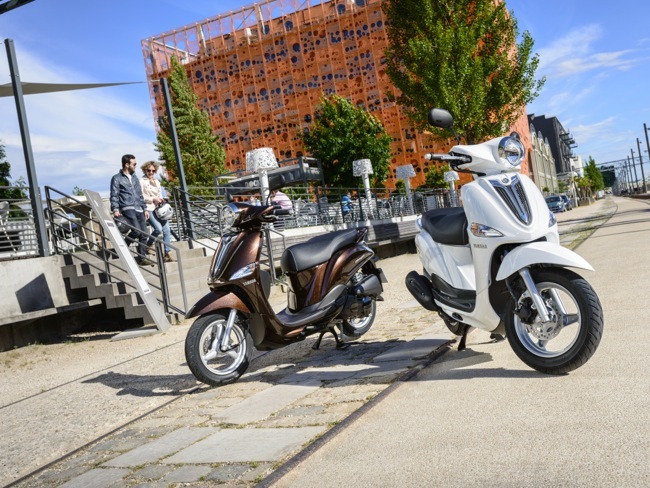 This ability to accelerate smoothly and quickly is one of the most important qualities on a scooter which is going to spend much of its time at zipping in and out of traffic and doing a lot of stop-start riding, such as pulling away from junctions and traffic lights. The character and specification of the D’elight's quiet and economical forced air-cooled engine have been designed to suit the typical daily usage which it will experience, namely urban commuting. In this situation, where there is a lot of stop-start riding and average speeds are relatively low, forced air-cooling is eminently suitable. This is because the engine is force-fed with cool air all of the time it is running, whether the D’elight is moving or sitting still in a traffic jam. The other important advantage of this simple forced air-cooled design is that it can often be lighter and more compact than an equivalent liquid-cooled engine, and this is what has allowed Yamaha's designers to fit the 114cc engine into such a compact 50cc-sized chassis. For easy steering and responsive suspension, the new D’elight runs with lightweight 3-spoke alloy wheels that are fitted with 90/90-12 tyres front and rear. As well as giving good traction and a comfortable ride, these popular-sized tyres are also economical to replace compared to the extra-wide designs used on some scooters, which helps to keep overall running costs low. D’elight riders can also be sure that their scooter's braking performance is up there with the best, thanks to its large diameter 180mm front disc brake. The lightweight drilled disc is slowed by a compact single-pot caliper, and together with the rear drum brake it offers smooth and even stopping performance. 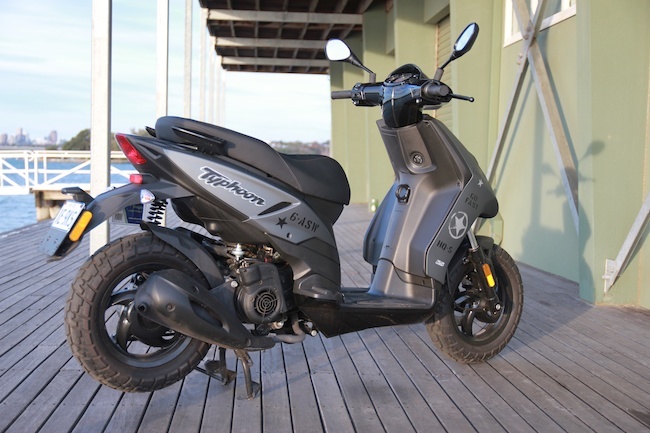 Featuring a lightweight chassis wrapped up in classically styled bodywork, the D'elight brings a touch of class to the important below-€2000 125cc scooter class. Its quiet and economical 4-stroke engine delivers strong acceleration for zippy urban performance, and with its agile handling and user-friendly nature, the D'elight makes stylish and affordable two-wheeled transport accessible to all those commuters who are looking for a cheaper, easier and more enjoyable way to start each day. Few other scooters in any category can offer so much for so little. A world first. 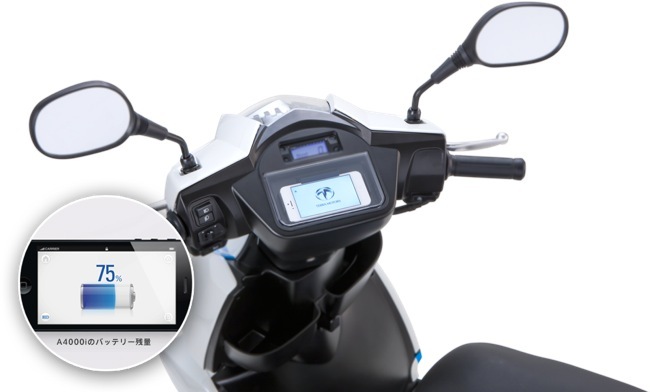 A scooter that integrates your iPhone into the dashboard. 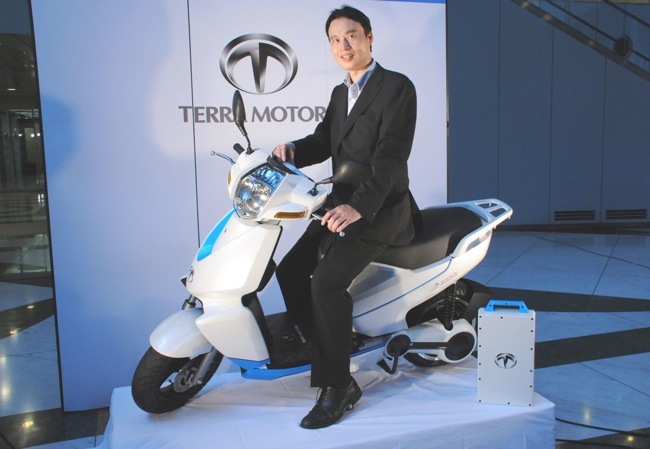 Terra Motors will introduce the worlds first "connected" scooter with the ability to update and connect with the manufacturer. To be released in late 2013, the Terra Motors A4000i will use an integrated iPhone to inform the rider of things like electricity consumption, remaining battery life, average speed, mileage and navigation information. In return, your iPhone will update and be updated through a Terra Motors app. This data will be communicated via normal 3G networks back to the manufacturer. The app will also record and allow the rider to follow their travels via the web. Other unique features include a removable battery that is said to last a massive 50,000 km's. The battery takes 4.5 hours to charge. The Terra Motors A4000i has been getting some significant attention around the globe for being the worlds first fully connected scooter. Built in Japan, the A4000i is yet to be given a recommended retail price. Doubt it will make it here in Australia and probably won't be that cheap either. If a standard bog-stock 946 is not enough, here is your list of available accessories and pricing. Those lucky enough to be purchasing a 946 might wish to individualise their new machine. 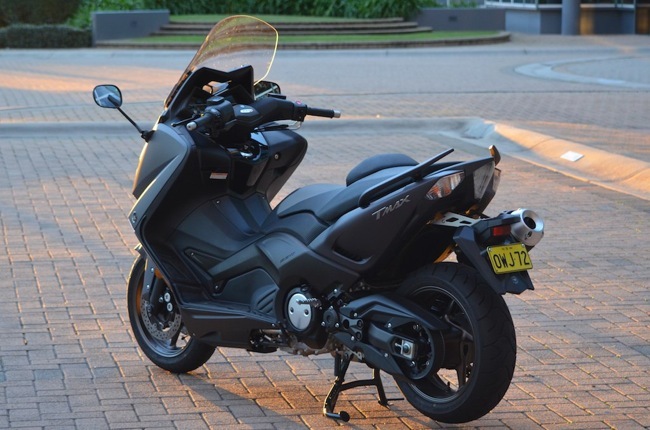 Piaggio Australia have recently released recommended retails for each of the 946 specific accessories that will be available. We've been spending some time on Aprilia's SRV 850 and immediately went searching for some go-fast accessories. 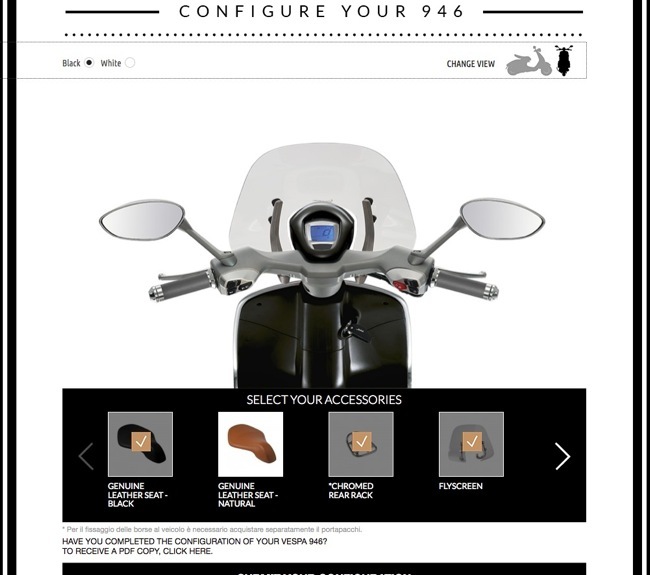 After literally flying around Sydney on Aprilia's latest scooter offering my attention immediately wandered towards accessories. Our test SRV 850 came fitted with a factory pipe and box option. The pipe is an Arrow offering complete with carbon tip and holder. 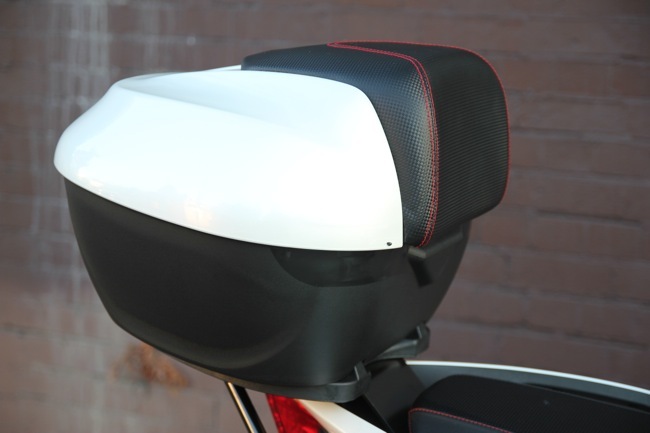 The top box is a 37 litre offering with matching backrest for the passenger. Both accessories are a must in my opinion, especially if ones forking out the bucks to buy what is the fastest production scooter currently available. 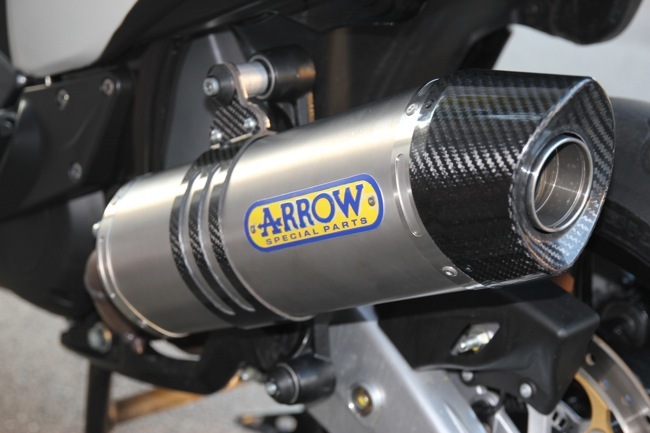 The Arrow pipe brings the Aprilia twin to life and sounds absolutely "horn". On full song or just at idle it gives the SRV a beautiful throbbing note. Aprilia Australia list the Arrow pipe at $1249. Available through your local Aprilia dealer. The top box option is a must if you need to carry anything substantial. The box includes rack and fitting kit and comes with matching red stitching that carries over from the seat. Again, available through your local Aprilia dealer at a price of $478. Comes in Black and white to match the current available colours of the SRV. Take a quick listen of the video below. We've taken some footage of the Arrow at full noise. Warning, if you're at work, turn the volume down! New Electric Delivery Scooter caters for the inner-city takeaway food market. Tonelli Motorcycles has been supplying pizza chains with petrol powered delivery scooters for a few years now. Until now, Tonelli has offered a 125 petrol powered delivery scooter for transporting pizzas and the odd beverage. With regulations changing, councils limiting noise after hours and companies looking for environmentally friendly alternatives, Tonelli has now developed an electric delivery version. The Electric Delivery is different from your everyday electric cheapy. 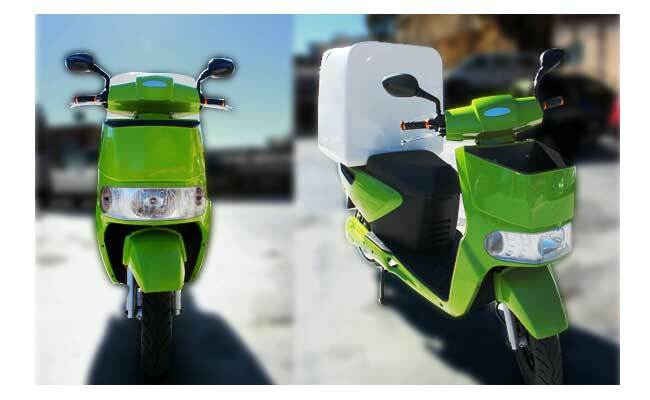 For starters the Electric Delivery uses an electric motor with the equivalent power of a 125/150 cc petrol engine, a full 3000 watt's. 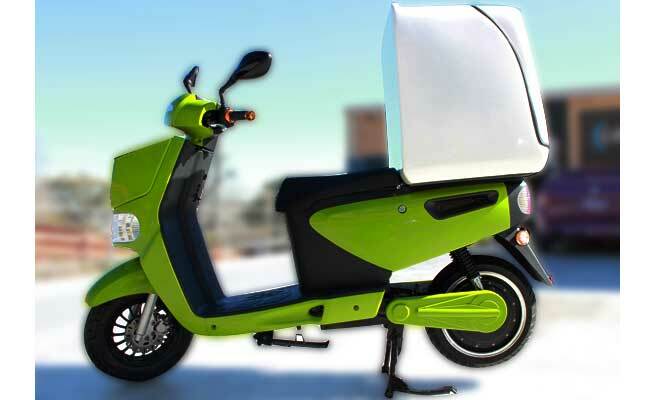 The Electric Delivery is capable of around 80 km/h fully loaded. The Electric Delivery will do a real world 120 km's distance under a single charge and it also features a regenerative braking system. Here's a few other benefits of the Tonelli Electric Delivery. The Electric Delivery will solve the noise curfews enforced within inner city suburbs, being electric it's near silent. It comes with a 10 year warranty on its electric motor. It also comes with a massive 175 litre storage box. The box itself is positioned directly over the back wheel for ideal balance. Tonelli also state that the Electric Delivery can be programmed to suit the local environment. For example, if you're in QLD and restricted to 50 km/h due to licensing laws, the Electric Delivery can be programmed to suit. Say you live around a hilly location and most of your riding is based around heavy pulling. Again the Electric Delivery can be mapped for this requirement. The Electric Delivery will retail for a little over the $6000 mark. Tonelli believes the lack of regular maintenance costs(compared with petrol alternatives) will offset the initial outlay fairly quickly. Sydney - An Aprilia ride day is scheduled for the 3rd of August. This includes Aprilia's all-new SRV 850. Scooter Central is holding an Aprilia ride day on Saturday the 3rd of August. On the day you can ride any Aprilia model starting from the budget SR MT 125 and ending with the worlds fastest production scooter, the mighty SRV 850. 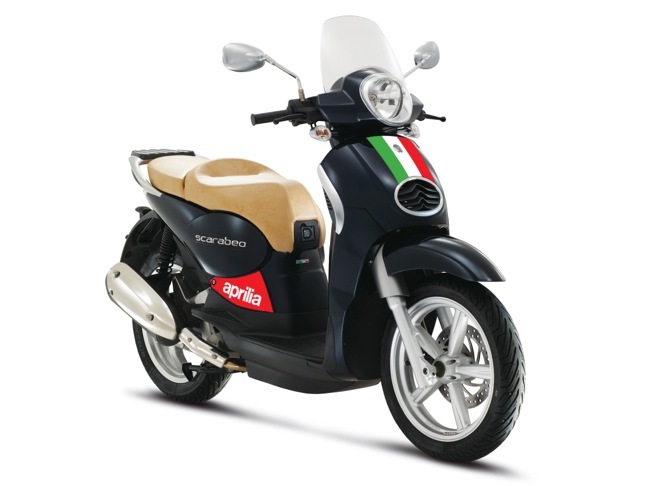 Other Aprilia models will include the Sportcity Street Cube, the Scarabeo 200 and the impressive SR Max. Bookings are essential so ring Scooter Central on 02 9938 5858 (Select 2). Ask for Grant, Pete or John to reserve your time. 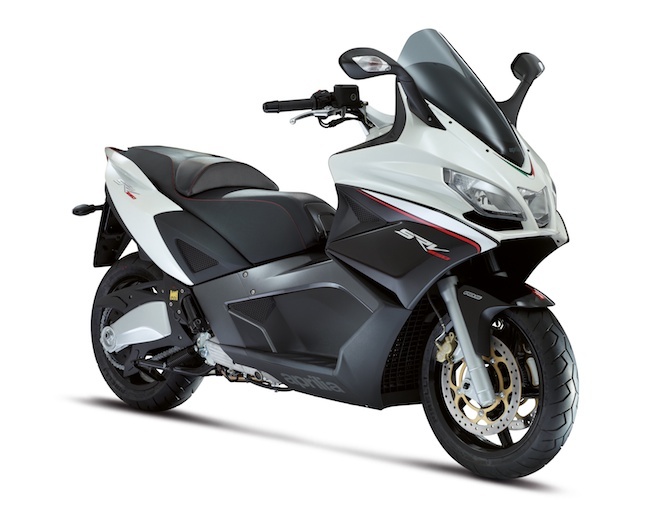 Since its inception the TMAX has been an act of steady progression. The 530 on the other end is all about perfecting an already solid performer. The TMAX has been the subject of a few major overhauls over the years and whilst each change has been an act of steady progression, each version has been an improvement over the last. 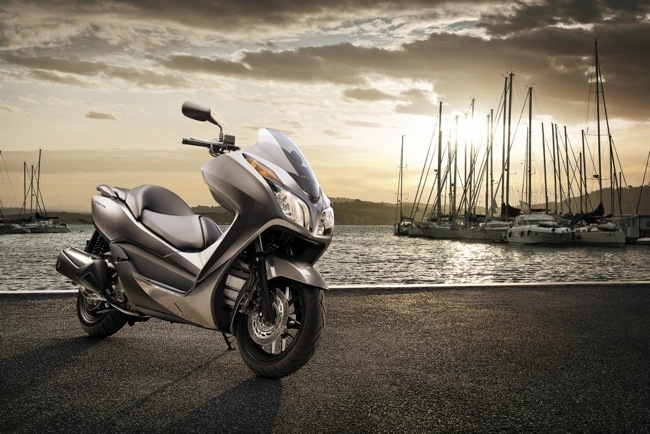 Introducing the latest incarnation, the all-new TMAX 530. With the new 530, instead of just taking a few steps forward, Yamaha has taken a giant leap. 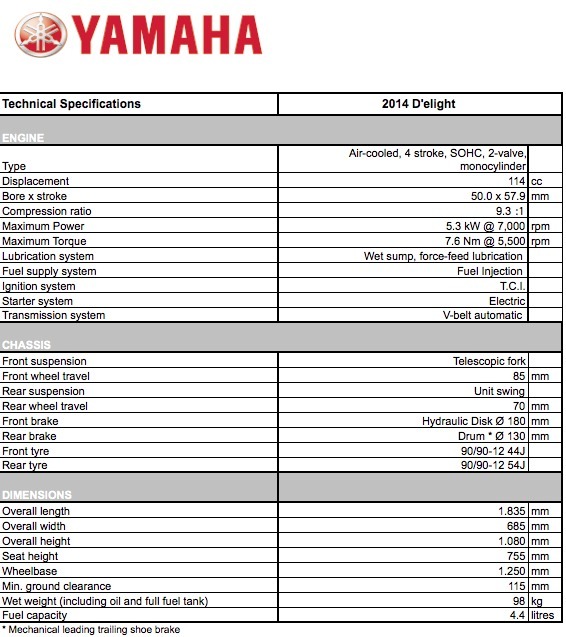 The list of changes over the previous model are many and Yamaha has clearly created something very special. Overall weight for the 530 is now down 4 kilos and the new two piece rear swingarm is responsible for most of that saving alone. It's also responsible for pushing more weight forward over the front wheel. The die-cast aluminium frame remains a masterpiece and one of the reasons the TMAX possesses its motorcycle-like dynamics. The engine displacement has been increased to 530 cc's and this has helped increase the amount of torque on tap. 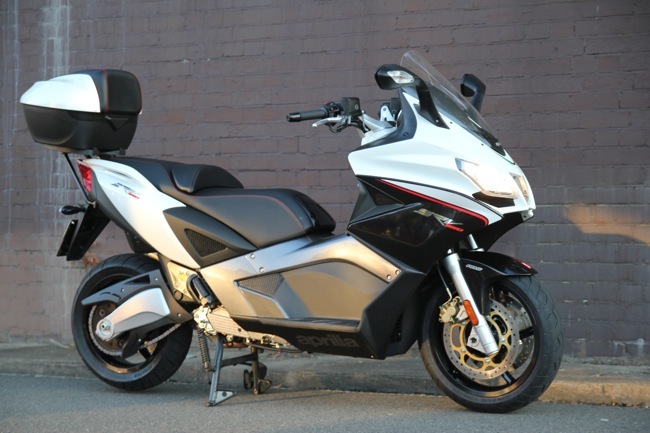 The TMAX 530 also features new CVT ratios, a new belt drive with tensioner, a host of new light weight engine parts and a revised fuel injection system. There's a new larger rear disc brake and a separate calliper is now used for the park brake. Front brakes remain the same size, two 267 mm discs with Yamaha's 4 pot callipers on each. An ABS option is available overseas, it's not available as an option in Australia. The front forks are full motorcycle type and 43 mm in diameter. The rear suspension is fully adjustable. The front wheel is 15 inch, the rear is 14. Wheels are new 5-spoke alloys. 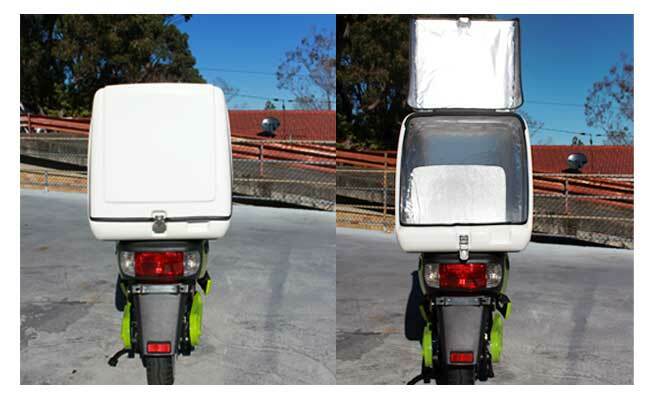 A fully lit storage area is complimented by an additional external helmet hook. 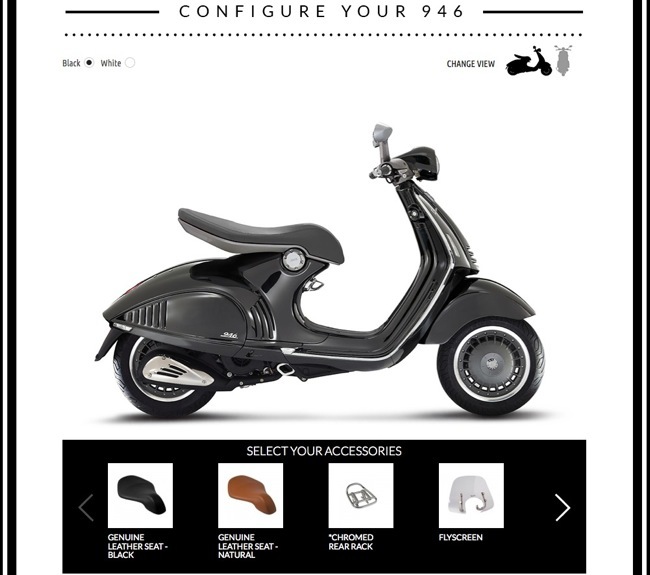 There's even an extension that will hook a 2nd helmet outside the scooter if required. The seat itself opens from the front and two gas struts look after the business, it's all very premium. There's enough storage for a helmet plus more, I was able to fit a backpack with a 15 inch laptop easily. There's also some additional glovebox storage if needed, one side being lockable with the ignition key. The screen is adjustable. It's not instantly adjustable like BMW's C600 Sport, though it does have the option of both high and low settings. The dash is all new. Two large "polygon" gauges with a series of digital readings in-between. Multiple trips, external temp, fuel, time etc. The dash is backlit orange/red and looks pretty cool at night. 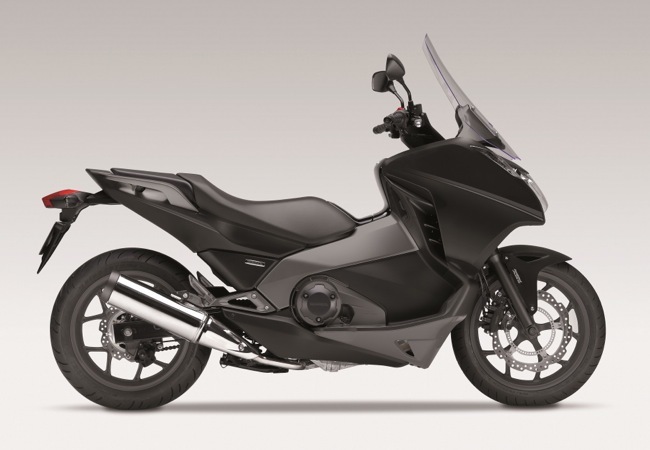 The external design changes bring the TMAX well into the future. The new twin projector headlights and centre run light look modern and angular. The rear end styling is all Yamaha R1. A really nice set of angles that give the MAX that true superbike family feel. It gives an impression the TMAX is incredibly short in real life. Our test model, and the only colour option in Australia, was the matt black/titanium/carbon combination. 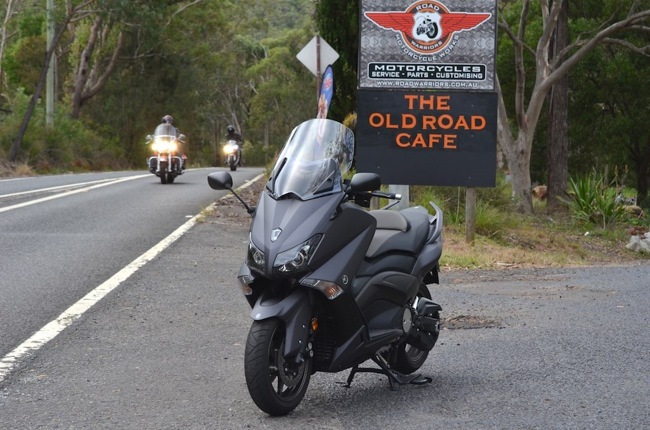 On the road is where the TMAX 530 makes the huge leap forward. 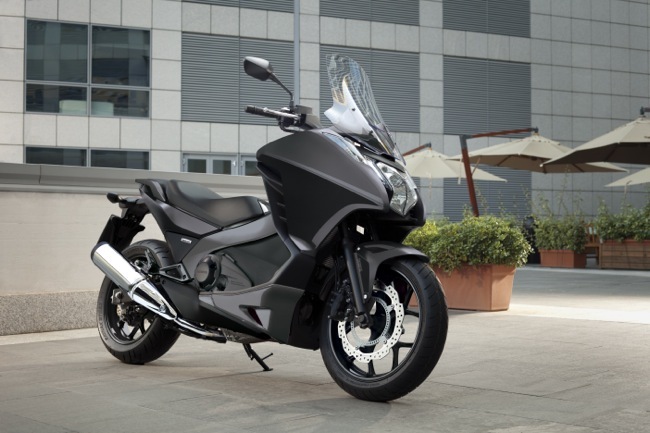 Seat of the pants will tell you the TMAX 530 accelerates with far more urgency from a standing start. The last TMAX was no slouch but it's clear Yamaha engineers have tuned the MAX for better low-down responsiveness. 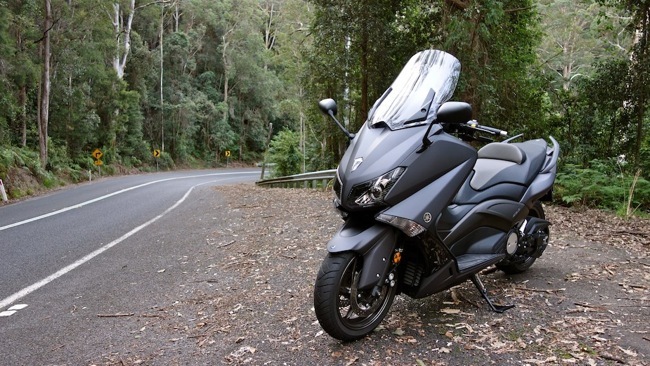 The TMAX is incredibly linear, responsive and fast, all the way up to 150 km/h plus. The parallel twin has gained a little character along the way also. Would sound even better with a factory Akrapovic can hooked up. The seating position and the reach to the bars will suit guys of a smaller stature. For me the TMAX fitted like a glove, was perfect even. The riding position gives you a sense that you're well over the front and well in control. The screen on the lower setting whilst fine for the city, needs some adjustment upwards if regular freeway appearances will be made. 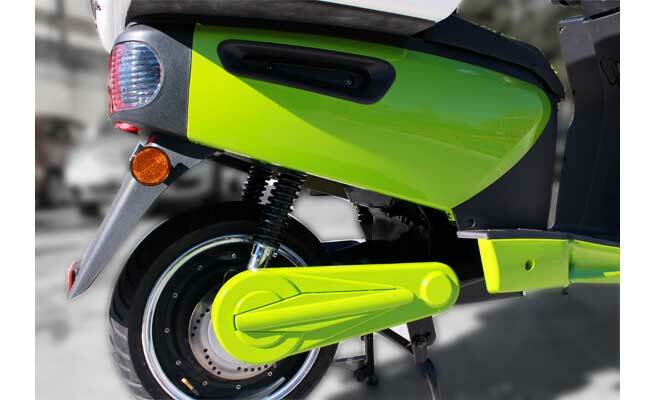 For a scooter, the TMAX provides ample feedback via the front end, thanks to a full motorcycle-type fork arrangement. The handling is predictable and provides an exciting level of ride quality. I like the way it feels on the road, the TMAX 530 is far from boring and actually very engaging for the rider. The TMAX will move around a little in fast bumpy corners and after a short blast up the old road all I'd do is give the back end a notch of adjustment to firm things up a little. I'm sure the new swingarm has a lot to answer for when it comes to improvements in handling and balance. Around town you have all the power you need(maybe too much) and tackling the daily commute on the TMAX is a perfectly reasonable request. I found using the mirrors a perfect way to gauge filtering distances between cars and the TMAX doesn't have that feeling of bulk around town. I did read another review saying this is one for the highways, well for me the TMAX 530 is very partial to city life also. Given its now usable power off the line, useful storage capacity, low seat height, sharp dynamics and slim proportions, the TMAX is a capable commuter. Probably disappointing for many is the absence of ABS. The option would just help add a level of reassurance when emergency braking. The brakes are some of the best around, still for a premium scooter like this, ABS shouldn't be an option, it should come standard. The front brakes are renowned for their ability, the levers are also 4-way adjustable, so you can squeeze a little or a lot depending on your preference. The TMAX makes riding fun. 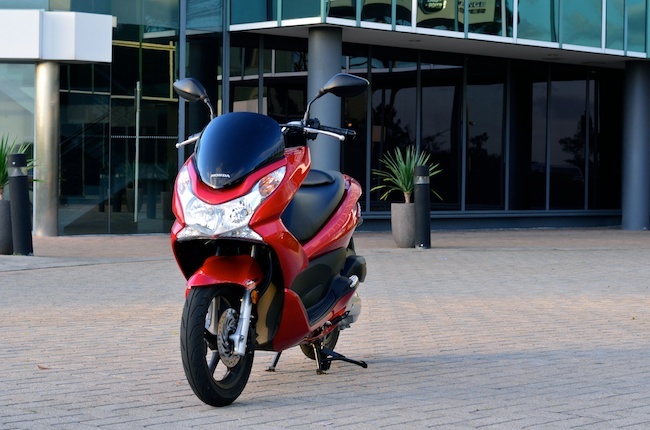 The TMAX 530 is compact and conveniently thin enough to commute 5 days a week. On the weekend it's fast and agile enough to carve up your favourite set of twisties. For me it's the perfect blend of power and practicality and it's no wonder the TMAX is the largest selling maxi scooter in countries such as Italy. The Italian influence is obvious. This new incarnation goes down as one of my all-time favourites. It's not one of those scooters I had to spend a few weeks riding around to appreciate. The TMAX 530 just worked for me straight out of the box. It's obvious I really liked the new TMAX. Yamaha engineers could have simply just added a bigger, larger and heavier engine. Instead they've taken the harder approach, purely perfecting what was already there. 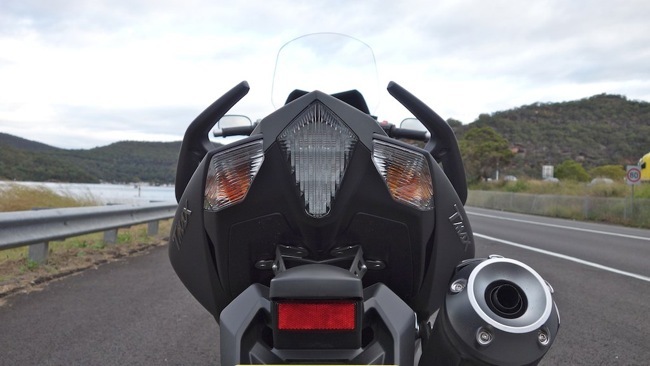 In my eyes, the new TMAX 530 is close to perfection, damn close. If it's all about being cool the Ape wins hands down. A new 200 c version is now available for the tourism industry in Italy. Yes, it's still being built. The Ape can trace its history all the way back to 1948. For some, the Ape carries just as must credibility as the humble Vespa. The Ape was responsible for getting Italy moving after the Second World War. Now sold under the commercial banner, this new Ape Calessino is more compact, comes with a fresh look and also features a new 200 cc Piaggio 4-stroke engine. The new Ape is being aimed squarely at the tourism industry. The name of the game is to transport people through historic cities with tight, twisty streets. The change to a lower capacity is important. This change allows riders from the age of 16 to ride or drive the Ape if they hold a suitable licence. Take a quick history lesson via the official Piaggio press release below. 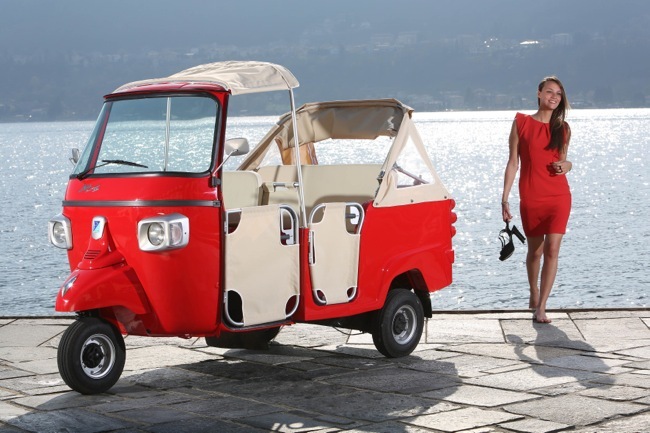 By the way, a new Piaggio Ape 200 will only set you back around $5000 Euro in Italy. Conceived for small businesses and ideal for goods transport even in the confined spaces of the narrowest city streets, with over two million examples sold worldwide, since its inception, the Ape has also always been considered an elite alternative for personal mobility that can readily be customised to suit any possible taste. And this was how, during the heady years of Italy's economic boom, the Ape Calessino (presented in 1949), revolutionised passenger transport, becoming part of the landscape in some of the most magical places of the country's historic cities and Mediterranean coastline. 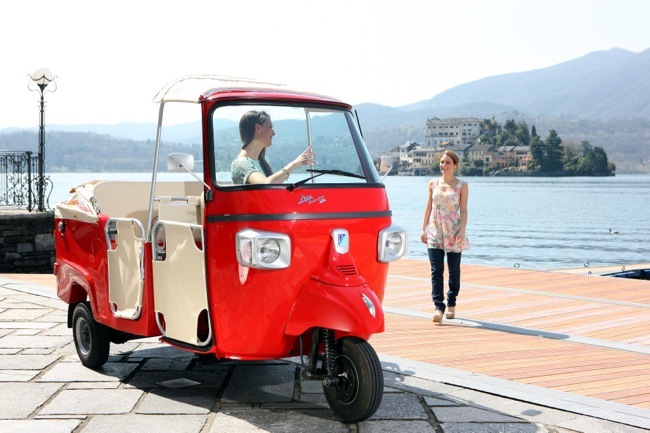 The Ape Calessino 200 is the intelligent, agile and light new version of the passenger transport Ape, and its more compact new size makes it the perfect choice for transporting passengers in historical town centres and tourist attraction sites, and for courtesy shuttle duty in resorts and recreational facilities. And with its innate cheeky character, the lightest variant of the Ape Calessino is ideally suited to brand promotion and advertising initiatives, and for special events, and has excellent potential as a vehicle for communication activities. As always, it will be highly sought after by collectors and anyone who enjoys the open air lifestyle. The design of the Ape Calessino 200 has also been radically revised and is fresh and contemporary, but remains true to its long traditions, with cues citing the styling elements that made the original Ape such a well-loved icon the world over. The softly vintage lines of the new Ape Calessino 200 encapsulate numerous references to the original design within its elegant forms: from the rounded shape of the front wheel cover to the steel roof bars, and from the proudly flaunted fuel cap to the taillights consisting of three distinct circular elements. Youthful in spirit and modern in style, the Ape Calessino 200 introduces elegant new choices for colour and trim.Three colour schemes are offered for the body: Western Red, Arctic White and Charming Blue. The four doors and easy to open and close soft-top are made from waterproof, washable canvas in elegant beige, and are mounted on frames in polished stainless steel tubing. The comfortable seats, upholstered in the same colour as the door and roof canvas, are equipped with lap type safety belts and accommodate two passengers and the driver in an ambience instantly evocative of the carefree, relaxed way of life of the most memorable vacation. There are also features for the comfort of the driver and passengers, such as canvas courtesy pockets on the doors for carrying objects, and a capacious oddments storage compartment under the driver seat. The latest addition to the Ape family is powered by Piaggio's new 200 cc, 4-stroke single-cylinder petrol engine, which produces 7.5 kW and is mated to a classic four-speed (plus reverse) gearbox. 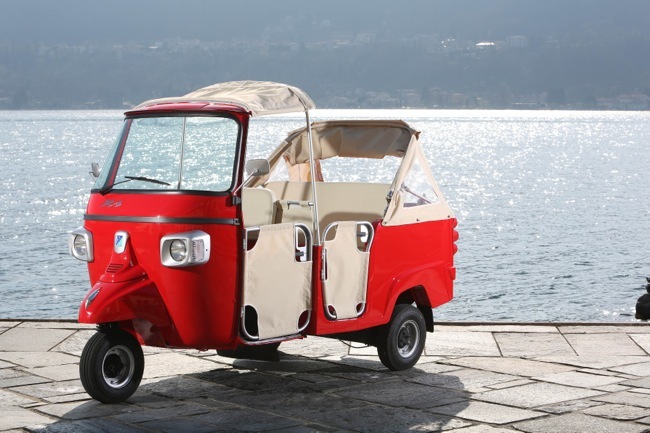 In Italy, this powertrain means that the Ape Calessino can be ridden legally persons over 16 with a category A1 licence, and by persons over 18 with a normal category B passenger car license. The new Ape range, created with the European market in mind, now caters for an even larger cross-section of users, and opens the doors (elegantly trimmed in canvas, of course) to a new concept of mobility. Overall motorcycle sales grow by 2.4 % over the first half of 2013. Full results by type within. Official numbers are in for the first half of 2013. Figures will show the continuing trend towards lower capacity commuter bikes. In particular motorcycles like the Kawasaki Ninja 300 or the new 500 range from Honda. The scooter market itself is down around 13% over last year. It would seem that many new buyers in the market are taking the entry level motorcycle path, a trend that has continued over the past two years. 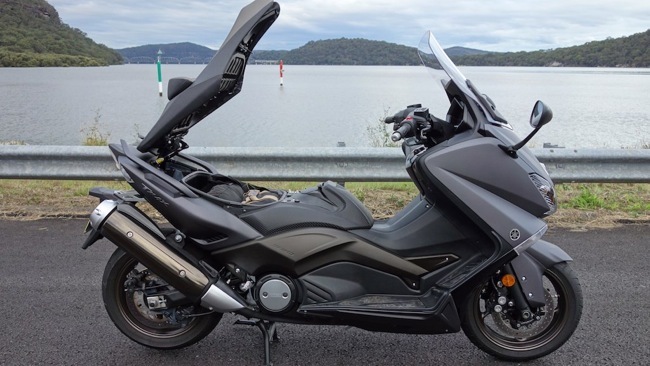 More than 53,000 motorcycles, all-terrain vehicles (ATVs) and scooters were sold in Australia in the first half of this year, with Honda leading sales of road motorcycles and ATVs. Yamaha led sales of off-road motorcycles and Piaggio led scooter sales. 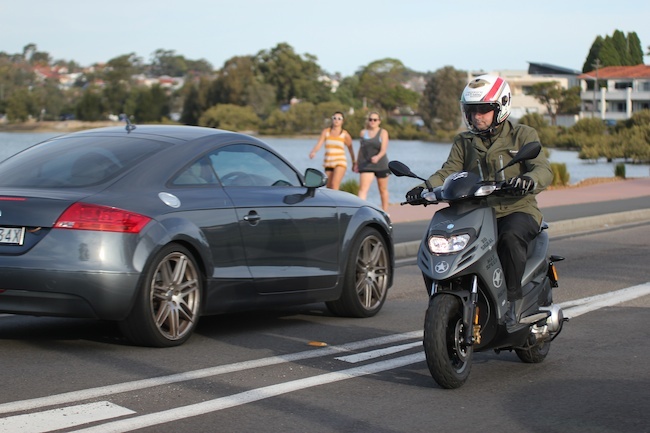 The industry sales figures released today by the Federal Chamber of Automotive Industries (FCAI) show motorcycles, ATVs and scooters sales for the period 1 January to 30 June 2013 were 53,594—2.4 per cent higher than in the same period last year. Specifically, road motorcycle sales increased 4.4 per cent to 21,169 unit and off-road motorcycles were up by 10.1 per cent to 17,195 units. 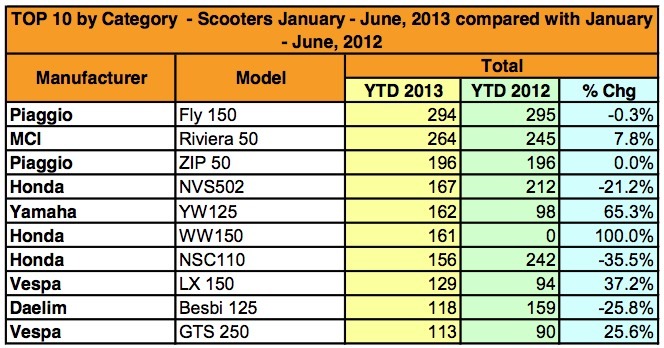 ATV and scooter sales decreased 4.8 and 13.2 per cent, respectively compared to the first half of 2012. Only 10,403 ATVs and 4,760 scooters were sold. 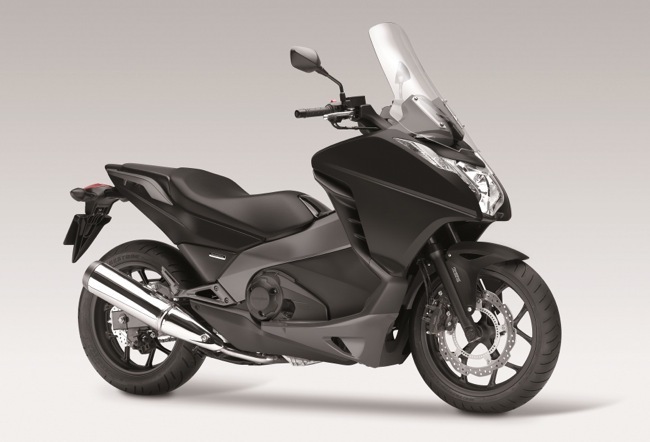 Honda led the sales of road motorcycles with 4,177 new units sold. Harley-Davidson came in second with 3,893 and Kawasaki in third with 3,694. With more new offerings in the road segment, KTM showed significant growth selling 412 units—a 157.5 per cent increase on their 2012 half year sales. In the off-road segment, Yamaha increased their sales by 4 per cent (4,719 units sold) compared to the first half of last year. These sales made them the lead off-road motorcycle producer for the period. Growing by almost 23 per cent, Honda took second place with 4,318 units. KTM and Suzuki were third and fourth, with 2,644 and 2,497 units respectively. Honda continued to grow their ATV sales—up 3.2 per cent to 3,137 units sold—to lead Australian sales of ATVs. They were followed by Yamaha (2,061), Polaris (1,724) and Suzuki (1,127). BRP experienced significant growth (785 units)—up 28.1 per cent compared to the same time in 2012. Despite a slowing Scooter market, Piaggio sales grew to 763 scooters—up 1.3 per cent from the same period last year—making them the top seller of scooters in the first half of this year. Honda came in second selling 611 units. Across all segments, Honda is the leading volume manufacturer for the first half of 2013 with 12,243 units sold. They’re followed by Yamaha with 9,017 units, Kawasaki with 5,809 units and Suzuki with 5,578. As we previously reported, the GTS 300 Nero Abisso arrives in dealers this month. Here's the official presser from Piaggio Australia. 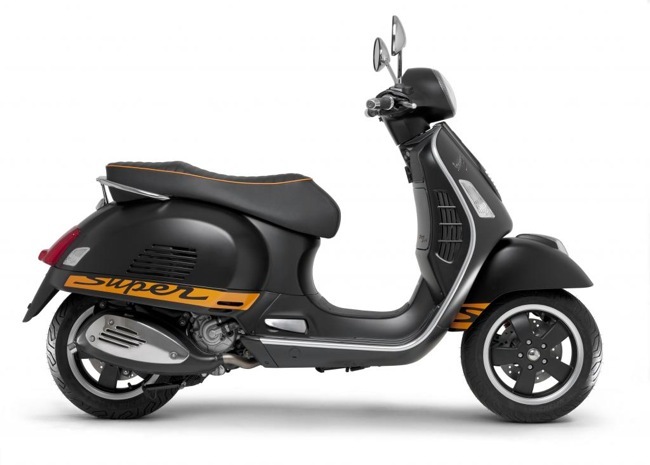 Vespa Australia is pleased to announce the new GTS 300 Super Sport in Nero Abisso has arrived and is available now. 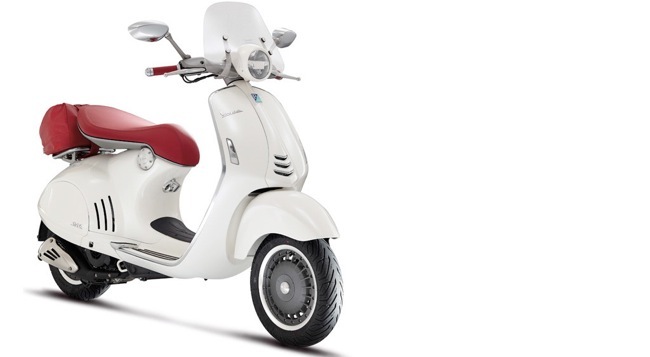 Produced in Italy in limited numbers, GTS 300 Super Sport highlights the Vespa sporting heritage. Proven performance of the powerful 300 Quasar engine combine with styling unique to this new model including Matt Black finish with orange decals and ribbed stitched saddle with orange piping to convey the excitement of the new Super Sport. Powerful and economical 278cc, 4-stroke, liquid cooled, 4-valve Quasar engine with advanced EFI and electric start. Easy to use automatic "Twist and Go" CVT transmission. Low emission environmentally friendly euro 3 compliant. Unique Vespa all-steel monocoque chassis for safe handling & longevity. Easy to read analogue speedometer with odometer, engine temp and fuel gauges. Anti-theft electronic key coded immobilizer plus body mounted security loop. Lockable underseat storage and glovebox plus handy shopping bag hook. Powerful front and rear disc brakes. Polished alloy fold out pillion pegs. Chrome rear grab rail and blacked out trim effects. Alloy two tone colour wheels. Large, comfortable, integrated pillion and passenger seat within-stitched piping, rib stitch surface and convenient seat cover. 2 year unlimited KM warranty. Piaggio's Typhoon reduced to $2490. Save $300 over the standard manufacturers list price. 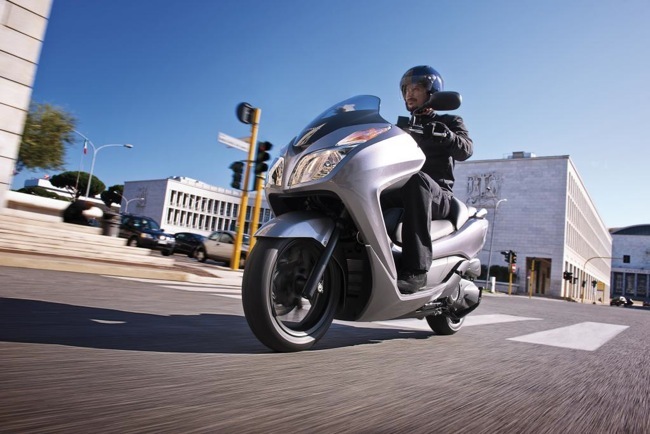 Piaggio Australia have reduced the base price of a Typhoon down to $2490. The Typhoon is Piaggio's budget commuter scooter and has been reduced down from $2790 (Was actually $2990 when first launched). The Typhoon features a 125 cc 4-stroke engine, flat floor, good levels of underseat storage and room for two if required. This new $2490 base price will translate into a Ride Away price of $2990. Distinctive sporty look and graphics. The new Honda Forza, Honda's newest scooter arrives this August. Official Australian release from Honda. Priced at $6549 + ORC. With the Italian word for 'strength' in its title, scooter riders be prepared for the new mid-size, sporty scooter from Honda. The NSS300 Forza will embody strength and flexibility and will make its way to Australia in August 2013^. This ideal all-rounder boasts excellent build quality, a long-range engine and usable practicality perfect for both commuter travel and weekend highway trips all for a competitive MLP of $6,549*. Powered by a 279cc, single-cylinder, four-stroke engine, the Forza delivers superb fuel economy as well as all-round usability and great cruising speed. Final drive is via belt and V-Matic automatic transmission which, while being crisp and responsive, is more than enough power to perform at highway speeds and give instant acceleration around town. With a chassis designed to provide the usability and comfort of a sit-in scooter with some of the excitement and fun that a motorcycle delivers, the Forza will be enjoyed by riders of all abilities. A low seat height, compact body width and slim floor plate ensure the Forza is easy to manage, whilst the seat itself is ergonomically shaped, helping comfort on the move. Nimble handling and stability at all speeds are ensured thanks to the Forza's lightweight steel underbone frame which is strong and extremely durable. Telescopic forks, twin rear shocks and a double-sided aluminium swingarm provide a comfortable and reassuring ride, while powerful front and rear disc brakes are assisted by Combined ABS. Specifications aside, part of the fun of riding a scooter is looking good and the Forza with its crisp, contemporary design has a bold presence on the road. The fairing presents a lithe and sculpted form while focusing on function. Wind and weather protection at speed is excellent without sacrificing the around-town ability of a smaller capacity scooter. 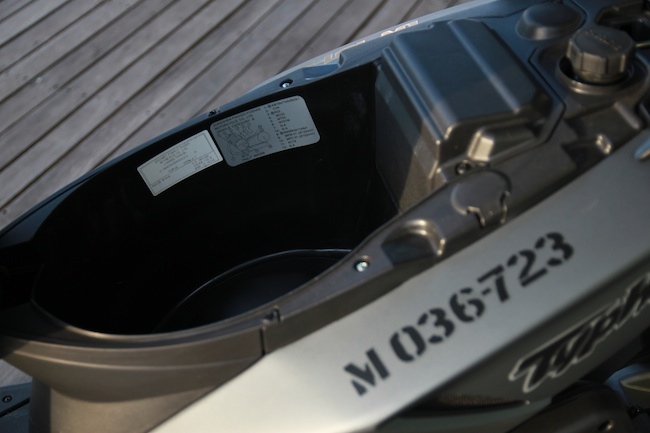 Big enough to accommodate two people in comfort, the Forza offers practical features such as an under seat space large enough for two full-face helmets, easily accessible dual fairing pockets and a large capacity lockable storage box beside the ignition. The comprehensive dash includes speedometer, clock, dual trip-meters plus fuel and temperature gauges. 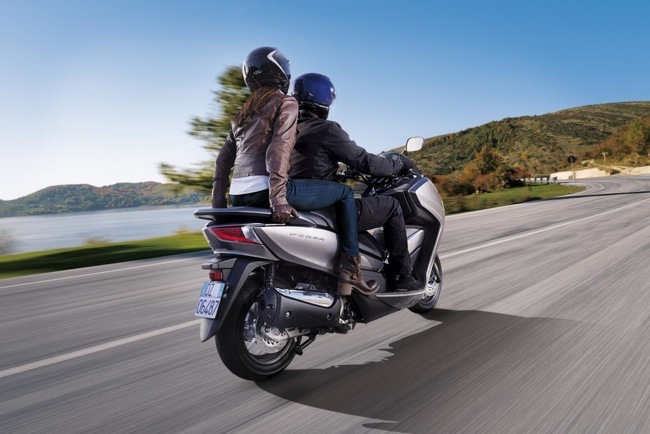 Honda's new NSS300 Forza boasts excellent build quality and a fresh strong design and will reach Honda Dealerships nationally with a competitive MLP of $6,549*. 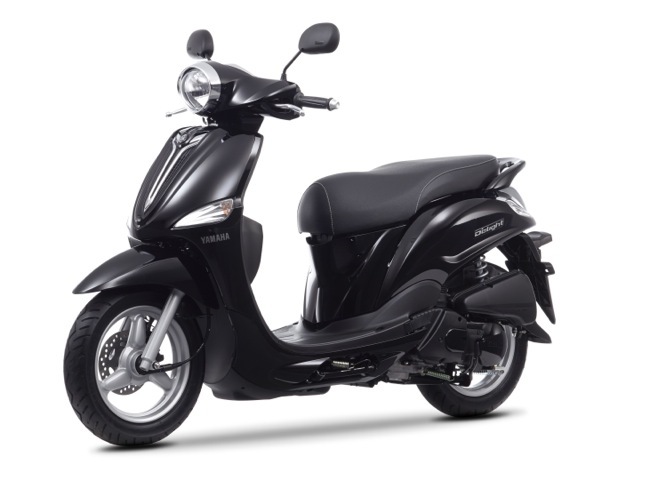 Due for arrival in August 2013^, the new scooter will be available in two sleek colours; Asteroid Black Metallic and Pearl Himalayas White. *MLP is the Manufacturers List Price and excludes pre-delivery, on-road and registration costs. ^Exact arrival dates are subject to change without notice.